Our 4 season rooms to let is a family business owned by Gkika family and has been around for over 20 years. The advantages of our facilities are the location and of course the affordable prices. 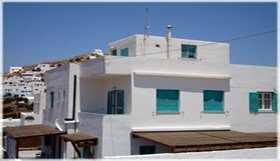 The rooms are clean and simple with all modern amenities like A/C, fridge, TV, kitchenette and are located in just a 2 minute walking distance from the bars and clubs of the island. The location is ideal because it is next to the nightlife, but a little bit outside from the center, which will allow you to relax whenever you find it necessary. Mrs. Kathlin and her daughter are always keen on helping you out with the whereabouts of the hotspots in Ios and are definetely 2 of the loveliest people you can meet in this unique paradise. After years and years of serving tourists and having more than 10.000 happy guests this family understands what the visitors of Ios really need and will do their best in meeting their expectations. Because of the fair pricing policy most of the rooms are booked early and therefor it is always wise to make an early booking, if you don't want to end up searching for accommodation with your luggage.For reservations please contact us using the phone or our e-mail.